It looks pretty good to me. But I recommend testing it before you spend a week rigging, you can do it in two ways. You should take the base mesh into Zbrush or Mudbox and paint away on it like crazy for an hour or so, see if it behaves smoothly and expectedly all over. You should do a quick test rig and bend all the important large joints, the ones that bend a lot, and see if there are any topology problems that jump out already at this stage. This can save you lots of heartache later. I found this on YouTube and I immediately thought of this thread. Steven, I think you’ll appreciate his morphs of “Women in Art” as well. 1- Done. Some weeks ago I tryed it just for testing zbrush 3, and it deformed nice. 2- Working on it. Already tested the shoulder, will test legs (hip zone) and knees. Maybe elbows too. Anyway, I´m gonna use a nice amount of blend corrections. Hopefull, I´m on the right track. I´ll be back to bother you guys with muscles deformations cheers! Thanks for the eyebrow reference, Steven. After seeing that, I realized my strokes were going in the wrong direction. Will also try to work on the pelvis area later. Thanks for the useful tips Stahlberg. I’ve just recently started to study loops, poles and whatnot so you must excuse me for being overly enthusiastic about them. But you’re quite right. I found that thinking too much about these things is taking too much of the time I should have spent actually working. Actually, I’m pretty interested in how you came up with the topology you use. The n-gons and tris in your mesh look so cleanly and strategically placed. Do you know by heart where you should place them or are there just areas on the body where n-gons and tris should be avoided? Thanks. Oh, and a Zbrush 3 question for anyone who can answer. Is the transpose tool a good indication of how a mesh will deform when rigged or does it work differently? I’m pretty new to rigging and figured I could probably do initial testing of the mesh with transpose if it behaves similarly. Transpose is like using move/rotate/scale with soft selection, the only bonus is the freely movable pivot points. It has absolutely nothing to do with rigging or skinning. Thanks for the reply. So does this mean it won’t be a good “preview” of sorts to see if anything on the mesh bulges or pinches in the wrong way? Worked on the pelvic girdle. Hi, I’m showing the wires of my latest work here. Hope they can be helpful. 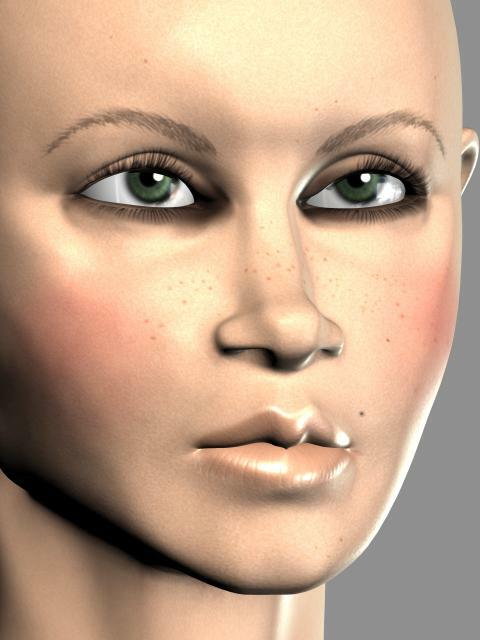 hi , i was try so mutch to create realistic human but i can’t Please Help Me! During learning when I have no idea what to do, I imitate someone else’s work. It’s an effective way to learn 'coz you’ll be able to internalize the knowledge. But it’s a slow process (for ordinary person like me). Be patient. as they are very great~ Appreciate! Is it better to combine all the pieces into a single mesh? C&c is more than welcome. Thank you! Would this type of topology work in ZBrush? Jeanise, very nice model…she’s your girl? lorely3000, thanks. yup she is one of my girls:)your model looks good but the polygons are quite dense. hope to see your new stuffs. Hello all, I’ve been reading and recommending this thread for a long time. Make it into a book and I would surely pay top dollar for it. I recently finished a head model for a freelance gig and would love some crits. The client was interested in the mesh itself as the final piece and so there are some things I was asked to do in the mesh that I realize would normaly be done in bump map or zbrush. But generaly I tried to adhere to topology techniques described in this thread.